Carbon capture and storage (CCS) is a process where CO2 emitted from large stationary emission sources such as fossil fuel power plants or oil refineries, is captured and stored geologically in the underground. Capturing CO2 means separating it from the other components of the exhaust from a particular emission source. The exhaust may contain anything from three to almost 100 percent CO2 , depending on the nature of the source. For instance, the exhaust from a typical coal power plant contains 12 to 15 percent CO2. The rest is mostly nitrogen, and some other gases and particles. Storing CO2 , also known as CO2 sequestration, involves compressing the CO2 and then transporting it by pipeline (or possibly ship if the storage site is far away) to a suitable location where it can be stored permanently. There are different kinds of storage locations. One possibility is depleted oil and gas reservoirs. One advantage with old reservoirs is that we can know for certain that they are capable of keeping the CO2 permanently, as it has already held oil or gas for millions of years. Another possibility is the storage in so-called saline aquiferes. 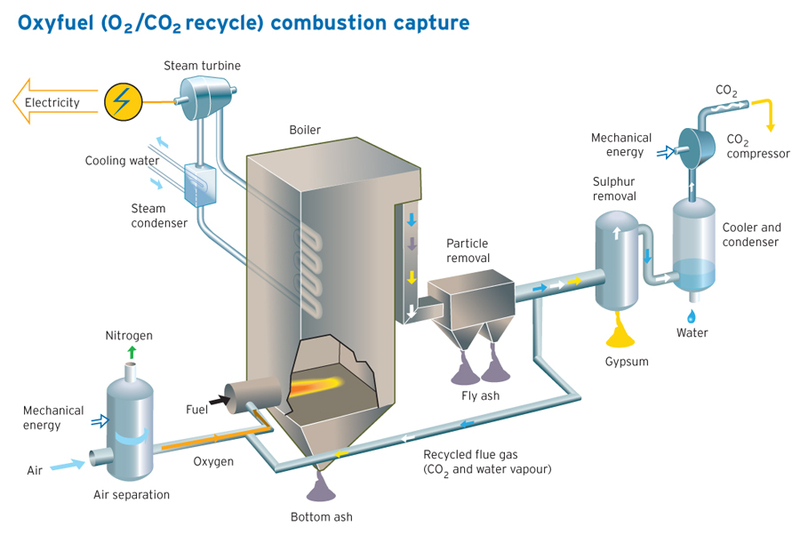 There are several different technologies available for capturing CO2 from industrial flues. Some of them are tried and tested technologies that have existed for decades already. Others are still in a small or large scale testing phase, while a few are only at the experimental stage. The most developed capture technologies are already in use in small and medium scale at different assets many places, for intstance in Europe, North-America and Japan. Up-scaling of these technologies is possible without significant technological adjustments. Construction of large-scale CCS projects could thus be realised today with known technology. Post-combustion capture is the most used solution for CO2 capture. As the name suggests, this involves capturing CO2 from the exhaust gas, after the fuel has been burned. The exhaust is run through a chemical solvent that binds the CO2. The remaining exhaust is emitted into the atmosphere, while the CO2 is separated from the solvent in a separation unit (called a stripper), and what remains is a pure stream of CO2 that can be stored. One of the advantages of post-combustion capture is that it can be fitted relatively easily on already existing emission sources, and it works on any kind of large stationary source, including industrial emissions. With the present solvents and technology, post-combustion capture units can remove over 90 percent of the CO2 from the flue gas. 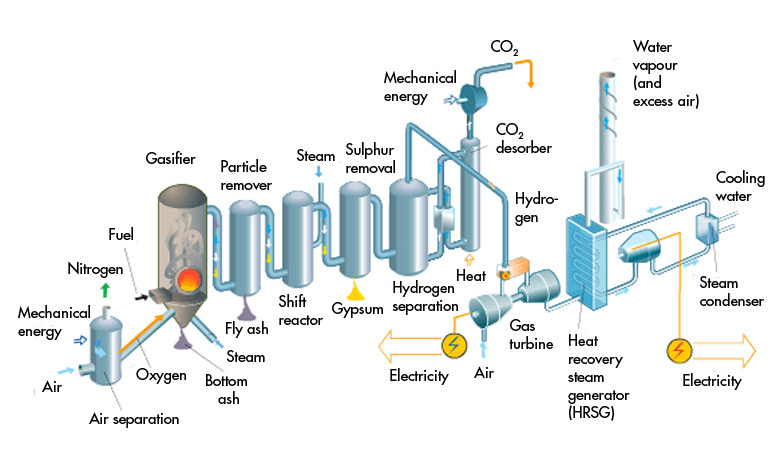 Pre-combustion capture is a process where the carbon is removed from the fuel before it is burned. Fossil fuels are hydrocarbons - a compound of hydrogen and carbon. Using a process that is well known from the production of hydrogen and fertilizer, the hydrocarbons are split into CO2 and hydrogen. The CO2 is removed for storage and the remaining hydrogen is used as fuel. Burning hydrogen doesn't emit CO2. The separation technology has existed for almost a century, but using hydrogen as a fuel in power generating turbines is a relatively new idea, requiring some further development to be fully ready for full scale use. This technology may yield higher captures rates than post-combustion capture. It is also very well suited for certain industrial processes, and for the latest generation of coal plants, which use a similar process to turn coal into gas before combustion (known as IGCC plants). However, this technology is generally only practical for new plants, as retro-fitting it onto already existing emission sources would require heavy modifications of the plant. Oxyfuel is the third major approach to CO2 capture. While in a normal power plant, fuels are burned with air, which contains only a fraction of oxygen, pure oxygen is used. When hydrocarbons are burned with pure oxygen, the exhaust will consist of only steam and CO2. Steam is easily condensated into water, leaving a pure stream of CO2 for storage. Oxyfuel capture rates are very high, making it possible to capture close to 100 percent of the CO2. However, impurities in the fuel may require additional purification of the CO2 stream. Oxyfuel may therefore be less suited for low quality fuels, like lignite. Oxyfuel technology can be retro-fitted onto some types of existing power plants, but not all. In Carbonate Looping process lime (CaO) reacts with CO2 from the flue gas in a fluidized bed reactor (Carbonator) producing limestone (CaCO3). CO2-free flue gas is released into the environment. In the second reactor (Calciner) the limestone is calcined and thereby CO2 is released. The newly formed lime is lead back into the first reactor and consequently the loop is closed. The carbonate looping process can be used to retrofit existing fossil or biomass fired powerplants for sequestration of CO2 from the flue gas. There are also several other technologies in development that may be used for CO2 capture in the future. 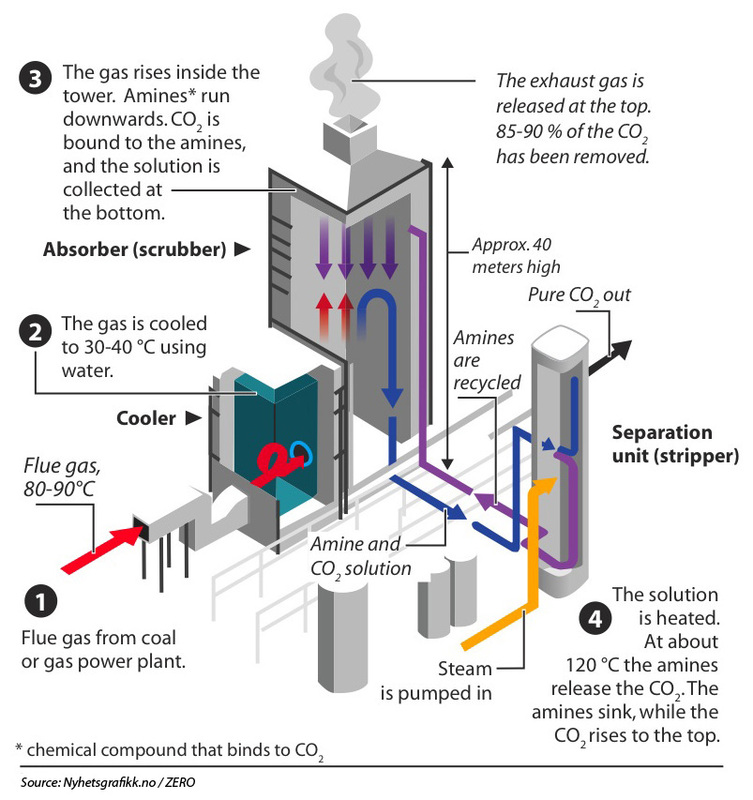 One promising solution is using membranes to separate CO2 from flue gas. A membrane is a material that has a structure that will only let certain molecules through. Natural gas fuel cells is another possible future technology. These technologies have great promise and may contribute much to increase capture rates, decrease the need for energy in the separation process and increase the overall efficiency of power plants with carbon capture. However, much research and development is needed for these technologies to be viable for large scale use. After being captured, CO2 must be transported to a storage site. The preferred way of transporting CO2 is by pipeline. Transporting CO2 is already being done extensively, so this is well established as a safe and reliable way to do it. However, if the distance to the storage site is very far, transport by ship may be an option. This would be done in much the same way natural gas is transported by ship today, with the major difference being that unlike natural gas, CO2 is not a flammable gas, so CO2-transport is safer. The first step of the transport is compression of the CO2. At high pressure, CO2 becomes a liquid, making it more easy to transport. Also, at the depths where CO2 would usually be stored (at least 800 meters) the natural pressure is high enough to keep the CO2 in liquid state. There are several types of storage sites available that are well suited for CO2 storage. The most important characteristic of a good geological storage site, is the presence of porous rock in which the CO2 can be stored (much like water is held in a sponge), and a layer of solid rock that prevents CO2 from travelling through on top. Old and gas fields that are no longer in production are excellent storage sites. These old reservoirs have been capable of holding oil or gas for millions of years without leakage, which means they are also capable of keeping CO2 safely stored for millions of years to come. An added advantage is the fact that oil fields are very extensively surveyed while in use, meaning we have all the information we need about storage capacity, rock qualities and other factors in the storage process. Existing wells that have previously been used to extract oil or gas may be used to inject CO2. Care must be taken that all existing, unused wells are securely blocked, so that no CO2 can escape through them. Deep, salt water-filled formations have a very large potential for CO2 storage. As with oil and gas fields, we know that such formations are capable of securely holding CO2, as they have been able to hold water for a long time without leakage. Still, the formations must of course be extensively surveyed to make sure that there are no cracks or weaknesses in the covering layer of dense rock that may allow CO2 to escape to the surface. Very good methods for doing such surveys have been developed by the oil and gas industry. Once the CO2 has been pumped into an abandoned reservoir or a water-filled formation, there are many different mechanisms that ensure that it stays there. These mechanisms actually become stronger over time, so the likelihood of any leakage becomes smaller over time. That is why CO2 storage can be expected to be safe over millions of years. The cap rock is the name usually used for the layer of high density rock on top of the storage formation. This is the "first line of defense" to keep the CO2 in place. The cap rock is made of shale or clay rock, a kind of rock that has very few pores for liquids or gas to travel through. It should be quite thick - several hundred meters, to be absolutely certain that it provides a permanent seal over the storage site. The pores in the rock themselves will trap a lot of the CO2, much in the same way as tissue paper absorbs and traps spilled water. More than half of the injected CO2 may be trapped this way even before it can migrate upwards to the cap rock. The CO2 will dissolve in water over time, and in a process that takes from a few decade to a few hundred years, most of the CO2 will be dissolved in the water that exists in the storage formation. Water becomes slightly heavier when CO2 is dissolved in it, and will therefore sink towards the bottom of the formation, which prevent the CO2 from escaping further. CO2 will finally be converted to solid minerals in a process where the CO2 that has been dissolved in water reacts with the minerals in the formation. This process takes several hundreds to thousands of years, but once mineralized the CO2 becomes a permanent part of the rock formation. The capacity for CO2 storage hasn't been extensively surveyed all over the world, but calculations based on the areas that have been well surveyed shows that the capacity most likely is at least 2000 billion tons of CO2. Yearly global CO2 emissions are just below 30 billion tons. Theoretically, there are enough storage capacity to store a significante part of the global greenhouse gas emissions. However, the known areas with high storage potential are unevenly distributed over the world, and we still lack knowledge about the storage possibilities in important industrial areas - particularly in developing countries. Therefore, it is important that efforts are undertaken immediately to improve our knowledge about the worldwide potential for CO2 storage.